The Cougar GX-S550 retails for €58.70, which is around US$66.10. It is currently not available in the US. The Cougar GX-S I evaluated today look very interesting, scoring a very high performance-per-buck ratio due to its affordable price. Cougar obviously sought to make a notable comeback in this category and brought Sirfa onboard for the platform of its GX-S models. The build quality is pretty good, although I expected better filtering caps than the Teapo SCs in the secondary side and a double ball-bearing fan since the PSU is covered by a five-year warranty. I know that such parts would increase its retail price, but am skeptical of whether this fan and the Teapo caps will survive five years of rigorous use. Such will most likely be the case with 230V input, though, since it puts a PSU's internal components through less because of higher efficiency and lower thermal loads. If this unit ever reaches the US, I suspect its warranty to be set to three years. With that said, the GX-S550 offers good performance for its category, with decent ripple suppression, tight load regulation at +12V, and efficiency that is on par with the majority of the competition. On the other hand, there is its hold-up time that is lower than required (but at least the power good signal is accurate) and its high inrush current when the APFC's bulk cap is drained, which is because Sifra didn't include an NTC thermistor. That is a very weird design choice considering an NTC thermistor is cheap. The sleeve bearing fan and absence of over temperature protection also make for a bad combination. Such fans don't have a high lifetime and aren't suitable for horizontal installation. Should this unit's fan break, there also is no OTP to save the day. 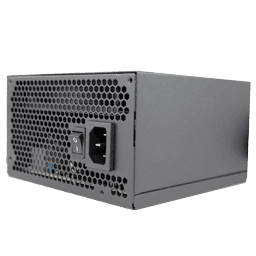 Despite its deficiencies, the GX-S550 is a pretty good PSU that looks to be a good choice for anyone who doesn't need modular cables. In this price range, you won't come across Gold-certified efficiency often, or such performance levels and a five-year warranty. I also do appreciate the fact that the power good signal functions properly, dropping well before the rails go out of spec. I have come across many Sirfa platforms with "fake" power good signals, so it was nice to see one working as it should.